The next step for applying the life-changing lessons of the bestseller Start With Why. With Start With Why, Simon Sinek inspired a movement to build a world in which the vast majority of us can feel safe while we are at work and fulfilled when we go home at night. However, many people have had trouble bringing the book's message into their own career and company. Now, alonThe next step for applying the life-changing lessons of the bestseller Start With Why. With Start With Why, Simon Sinek inspired a movement to build a world in which the vast majority of us can feel safe while we are at work and fulfilled when we go home at night. However, many people have had trouble bringing the book's message into their own career and company. Now, along with two of his colleagues, Peter Docker and David Mead, he has created a guide to the most important step any business can take: finding your why. This easy-to-follow guide starts with the search for your personal why, and then expands to helping your colleagues find your organization's why. With detailed instructions on every stage in the process, the book also answer common concerns, such as: What if my why sounds like my competitor's? Can you have more than one why? And, if my work doesn't match my why, what do I do? Whether you're entry level or a CEO, whether your team is run by the founder or a recent hire, these simple steps will lead you on a path to a more fulfilling life and longterm success for you and your colleagues. I'm a big fan of "Start With Why" which is why I picked this one one. It's structured as a guide to finde your why and the why of groups in general, such as entire companies and/or individual departments.I'm giving it 3 stars because though I have finished the book, I haven't yet been able to validate the method. Once I do, I'll review the rating. Often do I enjoy listening to the wisdom of Simon Sinek, but this book isn't worth the time. Esperaba mucho más del libro. Aunque hay ejemplos y conceptos interesantes, desde mi punto de vista el libro se hace muy pesado y creo que lo del workshop se mete con calzador. Se podía haber resumido en 20 páginas. Me ha decepcionado. The book is good, and the core idea of WHY discovery is nice. But IMHO the content could be reduced in half without losing anything important. Great listen on a short road trip today. Greater still for those running a team or larger organization. For the solo-preneur there are still several actionable items. But not a lot of meat on the bone for the one-person shop. I should have reviewed the description a little better when I bought this one. I saw Simon Sinek’s name and, having really enjoyed Start With Why and Leaders Eat Last, I purchased it without thinking. It turns out Simon only wrote the forward. The rest of the book reads like an instruction manual. I can only recommend it if you are truly planning to conduct a Find Your Why session for yourself or a team. Otherwise, skip this one and go back and read Start With Why. I am a champion of Simon Sinek's "WHY" message and have read all his books many times. I enjoyed Simon's "Find Your WHY", and understand that it's a practical guide, and as such it works well. I have always been interested in is "WHY" people do what they do and are they doing it for the right reason? Are they truly happy doing it? Would they do it for less or no pay? I purchased "Find Your WHY" because I felt it would be a good resource to help them find their "WHY". 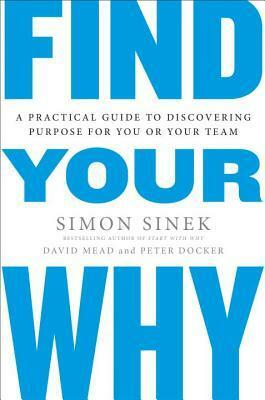 Eh I agree with the idea of this book—finding your why is important. However, this book ended up being WAY more company focused than I expected. I was reading it for myself, but feel no further enlightened upon finishing the book than I did before starting it. If you're reading for implementation at work, great. If you're reading it for personal improvement, I suggest trying a different book. I really enjoyed Start with Why. This book had some good nuggets in it but overall I didn’t find it helpful. It’s definitely geared toward a team environment (although it includes instruction for the solo worker). I can actually see co-workers going through these exercises together unless someone made them do it. Eye openingCouldn’t put the book down. After doing the exercise I realized that my current environment is absolutely wrong, in order for me to live my WHY. I had some sort of idea why I am doing what I do, had lost that feeling but continued on because I am in an industry that does fulfill my WHY. Now I can take steps to resolve the climate in my environment. This book isn’t a companion piece. It’s a more practical, concise expression of “Start With Why” and its fundamental premise. Sure, you get fewer illustrations. And perhaps you need to be inspired by the first book’s thesis. But I would recommend you read this book first, if you found Sinek’s TED Talk compelling and want to know what your next step should be. I loved Simon Sinek's 'Start With Why' and I'm a big fan and follower of his work. 'Find Your Why' overall was a good read, but honestly I was not impressed. As magnificent and fundamentally crucial the 'Why Discovery' process is, in my opinion the book fails to deliver the level of practicality I was expecting in the suggested steps for 'Why Discovery' process specially for individuals.